No position in professional sports is more important or more misunderstood than the quarterback. NFL scouts, coaches and general managers — the world’s foremost experts on football player evaluation — have been notoriously terrible at separating good QB prospects from the bad through the years. No franchise or GM has shown the ability to beat the draft over time, and economists Cade Massey and Richard Thaler have convincingly shown that the league’s lack of consistent draft success is likely due to overconfidence rather than an efficient market. Throw in the fact that young QBs are sometimes placed in schemes that fail to take advantage of their skills,1 that red flags regarding character go unidentified or ignored2 and that prospects often lack stable coaching environments, and there is no shortage of explanations for the recurring evaluation failures. All of this uncertainty makes the NFL draft extremely exciting: You never know for certain who will be good and who will be an absolute bust. Last year, much of the pre-draft speculation surrounded where current Buffalo Bills starting QB Josh Allen — who is tall and can hit an upright from his knees from 50 yards away — would be selected. 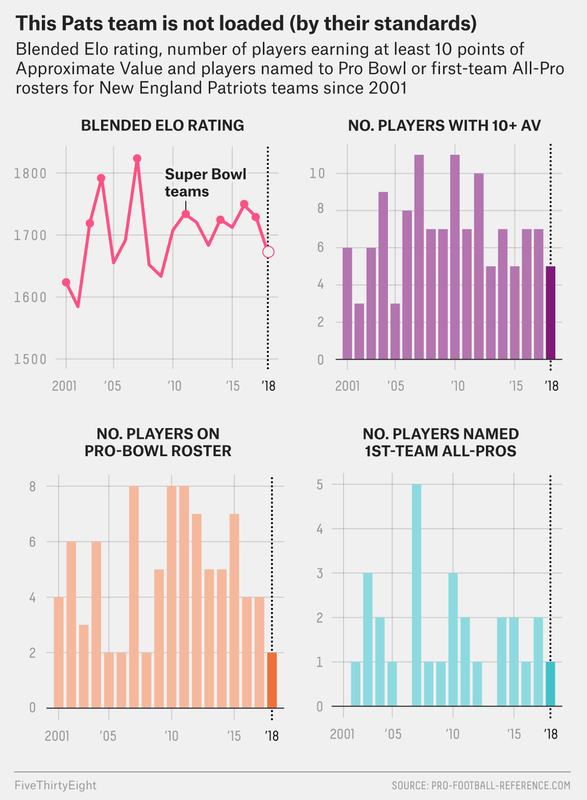 This year, when Oklahoma’s Kyler Murray decided to forgo a career in baseball for a chance to become a top pick in the 2019 NFL draft, his measurables captured attention in a different way. Murray, listed at 5-foot-10 and 194 pounds, is 7 inches shorter and more than 40 pounds lighter than Allen, and he’s the the smallest top QB prospect in recent memory. While some scouts and NFL decision makers think Murray’s odds for NFL success are long — or have him off their draft boards entirely because of his lack of size — there is strong evidence in the form of metrics and models that he is actually a good bet to succeed. Like the rest of the league, practitioners of analytics have a pretty poor track record at predicting QB success. It wasn’t just Browns fans who were high on Johnny Manziel — many predictive performance metrics liked him as well. If some of the world’s best football talent evaluators are convinced that Murray’s height is at least a minor red flag, how can we be confident that a 5-foot-10 college QB will be productive in the NFL? When it comes to the draft, deep humility is warranted. Still, there are solid reasons to be excited about Murray. Completion percentage is the performance measurable that best translates from college to the NFL. 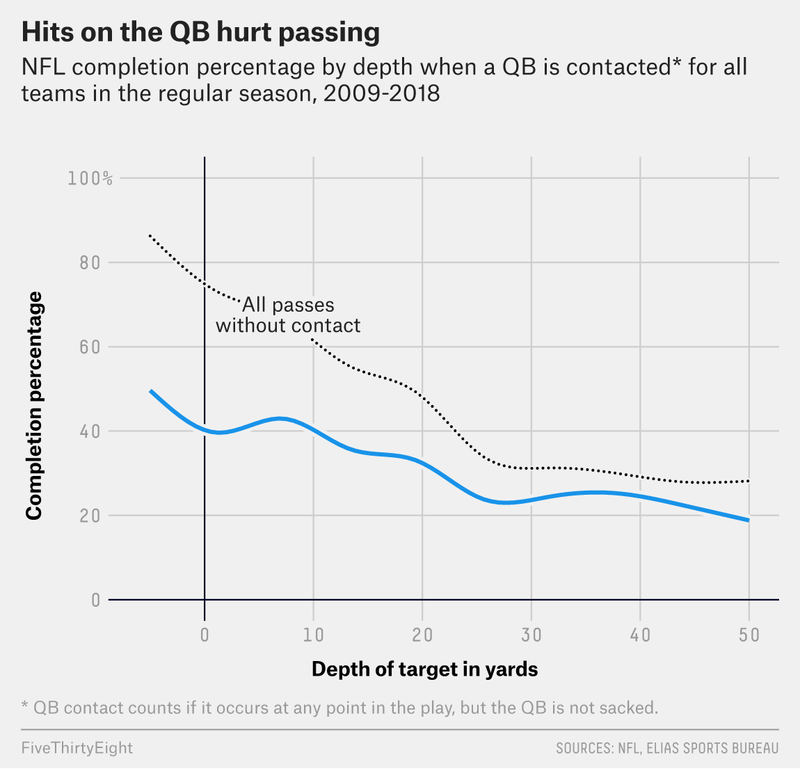 The metric’s shortcomings — players can pad their completion percentage with short, safe passes, for instance — are well-known. But even in its raw form, it’s a useful predictive tool. For players who attempted at least 100 passes in the NFL. “Share predicted” here refers to the amount of variance in the dependent variable explained by the independent variable in a bivariate regression. 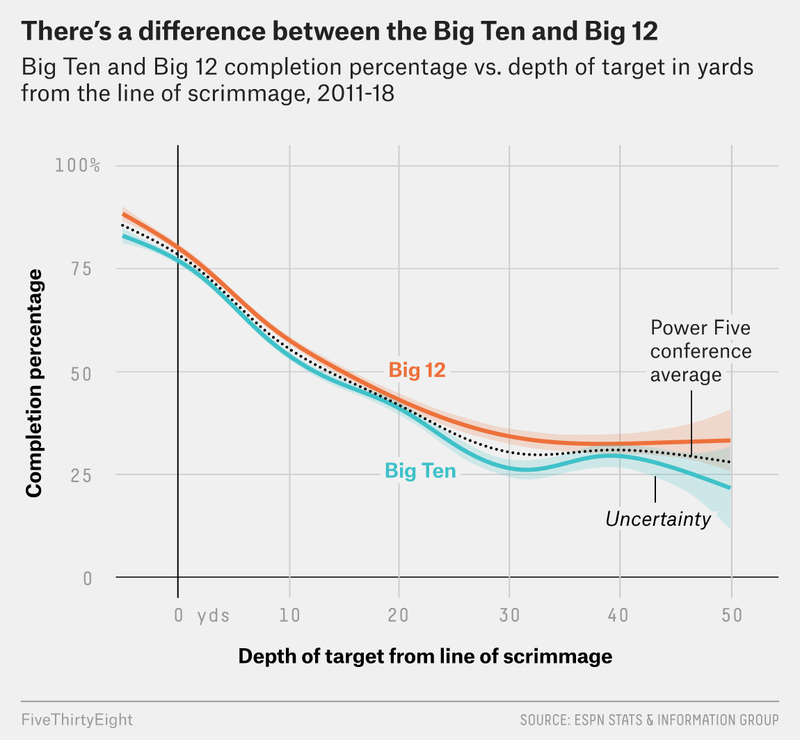 Its kissing cousin in the pantheon of stats that translate from college to the pros is average depth of target: Passers who throw short (or deep) in college tend to continue that pattern in the NFL. These two metrics can be combined3 to create an expected completion percentage, which helps correct the deficiencies in raw completion percentage. 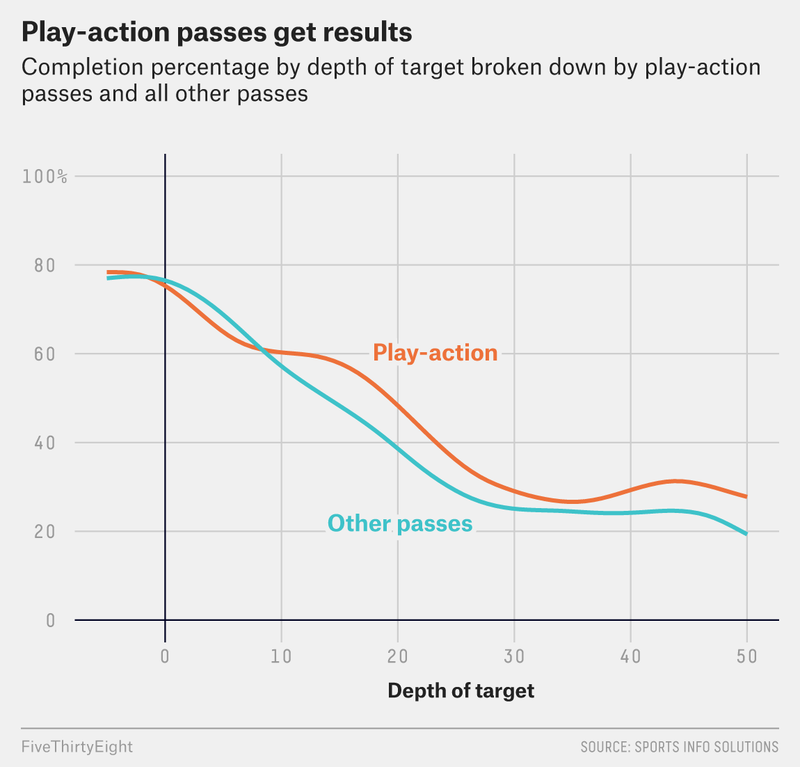 If you give more credit to players who routinely complete deeper passes — and dock passers who dump off and check down more frequently — you can get a clearer picture of a player’s true accuracy and decision-making. Another important adjustment is to account for the level of competition a player faced. ESPN’s Total Quarterback Rating does this, and we’re doing it, too. For instance, passes in the Big Ten are completed at a lower rate than in the Big 12 and the Pac-12. We should boost players from conferences where it is tougher to complete a pass and ding players whose numbers are generated in conferences where passing is easier. When we make these adjustments, and then subtract expected completion percentage from a QB’s actual completion percentage, we get a new metric: completion percentage over expected, or CPOE. An example: In 2011 at Wisconsin, Russell Wilson had a raw completion percentage of 73 percent. We would expect an average QB in the same conference who attempted the same number of passes at the same depths that Wilson attempted to have a completion percentage of just 57 percent. So Wilson posted an incredible CPOE of +16 percentage points in his last year of college. CPOE translates slightly less to the NFL than either raw completion percentage or average depth of target,4 but it does a substantially better job of predicting on-field production. 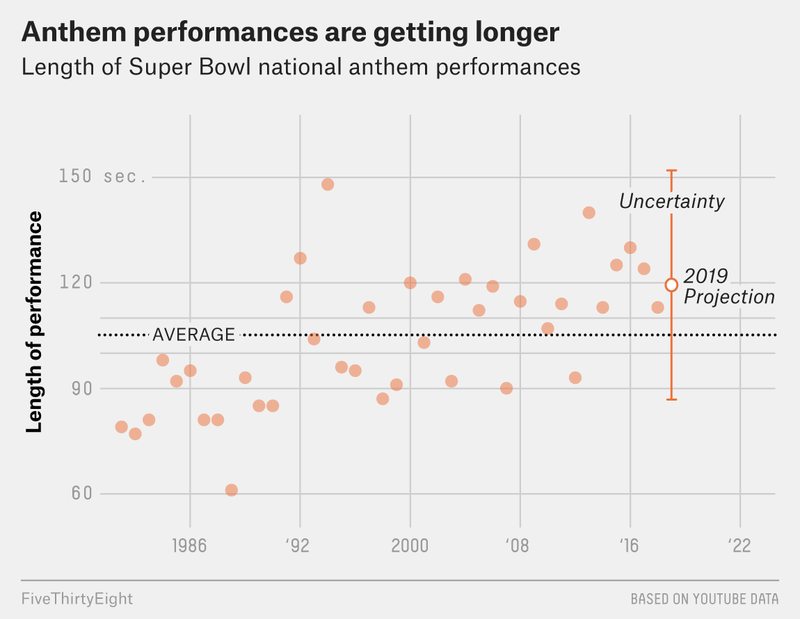 In stat nerd parlance, we’ve traded a little stability for increased relevance. But before we stuff the metric into a model and start ranking this year’s quarterback prospects, it’s worth asking why CPOE in college might be a good measure of QB skill. One possible explanation is that it’s measuring not just accuracy but also the signal from other qualities that are crucial to pro success. The ability to consistently find the open receiver and complete a pass to him requires a quarterback first to read a defense and then to throw on time and on target. Throwing with anticipation and football IQ are both crucial to playing in the NFL at a high level, and they are likely both a part of the success signal in the metric. CPOE is also probably capturing the ability to execute a system efficiently. A quarterback who understands how each piece of the offense complements the others and constrains the opposing defense is a huge asset for his team. The term “system QB” has a negative connotation in player evaluation circles that is probably unwarranted. If a quarterback is operating at a high level, he is inseparable from the system he’s being asked to run. It’s also likely the case that the mental and physical abilities to run any system efficiently are traits that translate — even if only imperfectly — to the pro game. CPOE also measures accuracy, of course — which many believe is the most important trait a QB can posses. Some coaches believe accuracy is an innate skill and not something that can be taught once a player has reached college. Others believe that mechanical flaws can be corrected if other traits like arm strength are present. The Bills clearly hold this view or they wouldn’t have drafted Allen, a player with an incredibly live arm but who had a college completion rate 9.2 percentage points below expected. But regardless of whether accuracy can be taught at the NFL level, all evaluators acknowledge its importance. 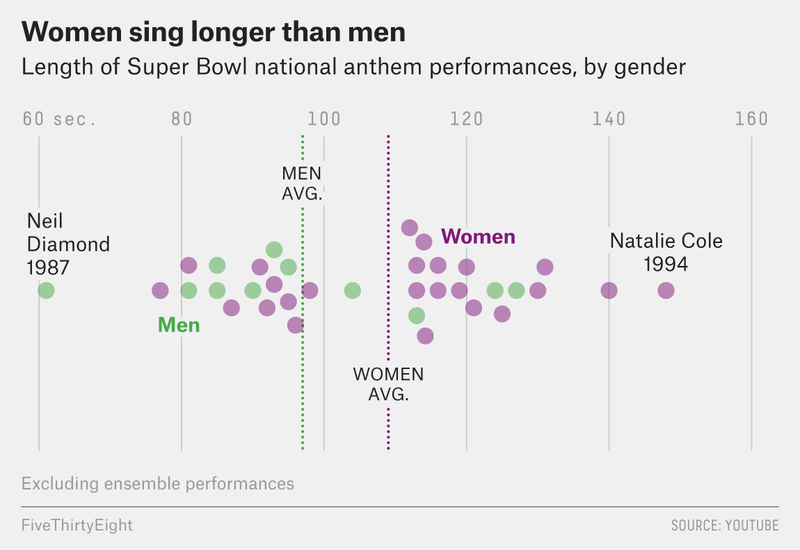 With all this in mind, I built a simple logistic regression model that attempts to identify players who will go on to establish a career mark of at least 7.1 yards per attempt in the NFL — the league average from 2009 to 2018. The model took into account CPOE and six other metrics, all calculated for the player’s college career.6 There are 49 quarterbacks who have entered the NFL since 2012 who have also attempted at least 100 passes — except for small-school QBs for whom advanced college data wasn’t available. I randomly split those players into two sets and used one set to build the model and the second set to test to see if the model is any better than random chance at identifying which prospects will go on to play productive NFL football. Though the model is relatively simple — and it would be wonderful if the sample size were larger — the results are promising. The model correctly identified many players who went on to have NFL success and many more who didn’t. The best estimate for its generalized accuracy is that it will correctly identify a QB prospect as a hit or a bust in around 74 percent of cases.7 The table below shows the results of the model, labeled Predict, and includes players’ college stats. *And have attempted at least 100 passes in the NFL. †Probability the player will meet or exceed a career yards per passing attempt average of 7.1. The model was also suspiciously bad at predicting Lamar Jackson, ranking him as an almost sure bust as a passer. Jackson’s career yards per attempt — most of those attempts coming in just seven games — is right at the 7.1 threshold, and while he is no one’s idea of Drew Brees, a success probability of zero seems an overly harsh assessment for a player that has clear talent — especially running the ball — and has already helped his team to the playoffs. Still, the good outweighs the bad. The only other false negatives in the bunch are Kirk Cousins and Marcus Mariota, both of whom have career yards per attempt figures above 7.1. Meanwhile the low probabilities assigned to passers like Nate Peterman, Zach Mettenberger, Paxton Lynch, Geno Smith and Blake Bortles all appear reasonably prescient. Looking forward and applying the model to the current draft class, we find a few surprises. Kyler Murray sits comfortably at the top with a 97 percent probability of being an above-average pro quarterback. Murray’s physical and statistical production comps with Russell Wilson are especially striking. Wilson and Murray had roughly the same yards per attempt in college, identical average depth of target and similar Total QBR.9 Both are also under 6 feet tall and played baseball at a high level. As far as comps go for short QBs, you really can’t do any better. Murray isn’t just a scrambler who excels working outside of the pocket and on broken plays, either. According to the ESPN Stats & Information Group, 91 percent of Murray’s 377 pass attempts in 2018 came inside the pocket, and 81.6 percent of those throws were on target and catchable. Murray faced five or more defensive backs on 82 percent of his passing attempts and threw a catchable pass 78.8 percent of the time. Against nickel and dime packages, he was even better when blitzed, with 79.1 percent of his passes charted as catchable when the defense brought pressure. And Murray didn’t just check down to the outlet receiver when the other team sent heat. Kyler pushed the ball downfield at depths of 20 yards or greater 21 percent of the time vs. a blitzing defender. Meanwhile the other consensus first-round talent, Ohio State’s Dwayne Haskins, is viewed as much less of a sure thing by the model. While his CPOE is identical to Murray’s and his QBR is similar, the model rates his yards per attempt and low average depth of target as red flags that drag down his probability of success. Nickel is the base defense in the NFL, so a quarterback’s performance against it is important, and Haskins faced five or more defensive backs far less often than Murray, dropping back against nickel or dime on just 63 percent of his pass attempts. And when Haskins was blitzed out of those looks, he was not as adept at delivering on-target passes, with 76.4 percent charted as catchable despite only 6.6 percent traveling 20 yards or more in the air. Other surprises from the consensus top-four prospects are the rankings of Duke’s Daniel Jones and Missouri’s Drew Lock — both of whom completed fewer passes than we would expect, and both of whom were assigned a low probability of NFL success. Teams should probably be very wary of both players. Since 2011, college QB prospects with completion percentages under expected — a list that includes Brock Osweiler, Trevor Siemian, Mike Glennon, Matt McGloin and Jacoby Brissett — have all failed to post career yards per attempt above the league average of 7.1. Meanwhile West Virginia’s Will Grier — a player few experts have mocked to go in the first round — looks to be the second-best QB prospect of the class. With his excellent college production and nearly prototypical size at 6-foot-3 and 217 pounds, Grier is a player whose stock could rise with a good performance on and off the field at the combine. There are many weeks of interviews, testing and evaluation left to come for each of these prospects, and analytics are just one piece of the process. Models are certainly not a player’s destiny. Murray might end up profiling as a selfish diva who can’t play well with others. Lock could somehow morph into Patrick Mahomes. But ultimately the model and the metrics agree with Arizona Cardinals coach Kliff Kingsbury’s assessment that Murray is worthy of the top overall pick in the draft. Ship him off to a team with an early pick and a creative play-caller, and enjoy the air raid fever dream that follows. John Elway sees a Hall of Fame quarterback every time he looks in the mirror. So you can imagine the frustration of the Denver Broncos’ general manager that he hasn’t been able to spot a new franchise QB since Peyton Manning left town three years ago. When the Broncos open the 2019 season, Joe Flacco is expected to be the fifth player to get a crack at the position since the 2015 campaign that culminated in a Super Bowl victory. Flacco’s signing came as a shock to Case Keenum, the team’s starting quarterback last year. But it should hardly have been a surprise given that, in Elway’s eight years in charge of the team’s roster, he has already cycled through seven different starting QBs.1 Flacco hardly seems a long-term answer entering his age-34 season — or an answer at all given that he’s 39th out of 42 qualifying starters in yards per pass attempt over the past three seasons, according to ESPN’s Stats & Information Group. The Broncos are 29th out of the 32 teams in Total Quarterback Rating2 since the start of the 2016 season. And the teams behind them — the Jets, Cardinals and Browns — drafted quarterbacks in 2018 with top-10 picks. It’s difficult to make the case that Flacco is any more likely to reverse the team’s fortunes at quarterback than Keenum was. So the Broncos’ search for a quarterback probably isn’t over. Elway admitted after the season that the team needed to find a long-term solution. But they’re not the only team in the NFL with that problem. Washington, Miami and Jacksonville are reportedly looking for new quarterbacks, probably vying with Denver to add one via the draft. And the Giants are widely expected to draft a quarterback after general manager Dave Gettleman refused to commit to Eli Manning as the team’s 2019 starter. Usually, endless quarterback searches correlate with losing. The best example since Elway joined the Broncos’ front office in 2011 is the Browns, who have won just 24.6 percent of their contests while seeing 10 quarterbacks start at least five games. 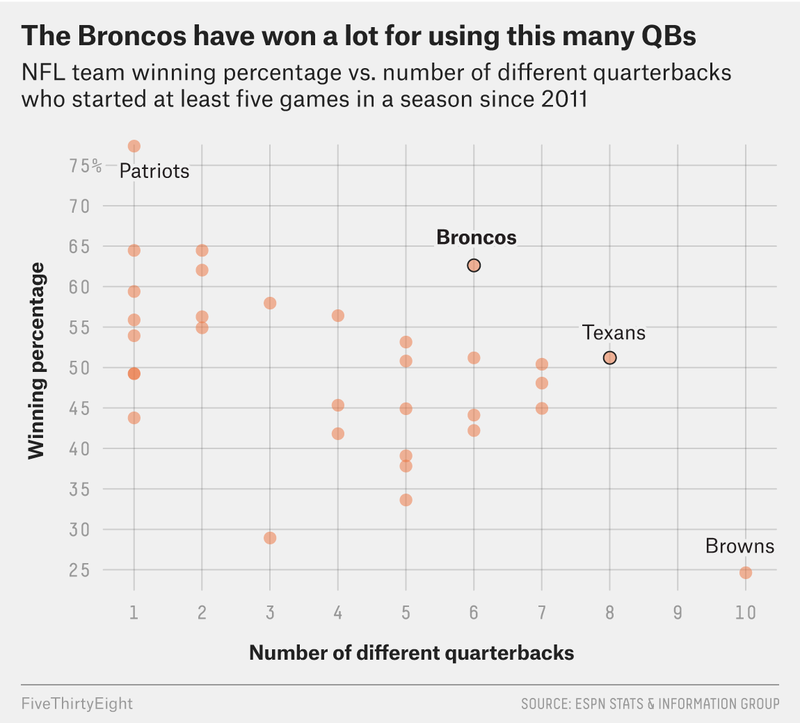 But Denver has managed to win 62.6 percent of its games in that time — the highest winning percentage of any team with at least five different quarterbacks who started at least five games. Most of Denver’s success in this time frame came with Manning under center. He delivered consistency and success (45-12 regular-season record) to a franchise that hasn’t seen the same quarterback start five seasons in a row since Elway did it himself. So a more impressive showing may belong to the Houston Texans, who somehow posted a 51.2 winning percentage despite starting eight different quarterbacks. The Texans finally seem to have found their long-term answer: Deshaun Watson, for whom they traded up from the 25th slot in the 2017 draft. The Broncos had a higher selection to trade that year (20th) but held it to select tackle Garett Bolles. One of Elway’s problems is that even without Manning, the Broncos have not been bad enough to be in position to draft a top quarterback. This year, they’re slated to pick 10th — behind both the Giants and Jaguars. But with a 20-28 record over the past three seasons, they’re not overcoming bad QB play, either. If Flacco does take over as signal-caller, this would be the second year in a row that the Broncos will have looked to another team for its starting QB. That’s an unconventional path to finding a signal caller given that last year, with Keenum, Denver was one of just four teams3 to have a passing leader by attempts who had ever played with another club. Elway has tried drafting quarterbacks, too, selecting presumed Manning replacement Brock Osweiler in the second round of the 2012 draft, Trevor Siemian in the seventh round in 2015 and 26th-overall selection Paxton Lynch — Elway’s one first-round quarterback pick — a year later. Despite the opportunity to learn tips and tricks from Elway, who mastered the position at a Hall of Fame level, none of those players is currently on Denver’s roster. When he took the job, Elway expected that a consensus franchise quarterback would have to be acquired with a top-five-overall pick. He also believed that one could be developed with the right supporting cast, including the coaching staff. But he did not sound like someone who knew what to look for. Flacco has a reputation for being big-armed like Elway, who was famed for imprinting the “Elway Cross” into the chests of his receivers with the velocity of his perfect spirals. But that element to Flacco’s game has faded in recent years: Since 2016, he ranks 37th out of 41 quarterbacks in Raw QBR on passes 20-plus yards from the line of scrimmage. Yet Elway seems content to bet on Flacco’s reversing the team’s fortunes at least in the short term. Does Elway see something in Flacco that few others can, given how widely the transaction has been panned? Or is it possible that one of the greatest quarterbacks in NFL history just can’t judge or develop quarterbacks? The same presumably holds true for knowing what to look for in a player at the position you played. So it just may be that the worst person to pick the new Elway for the Broncos is Elway himself. Throughout the 2018 regular season, the Seattle Seahawks made a conscious effort to establish the threat of the running game in the minds of their opponents. In the face of record offensive production across the NFL — driven in large part by prolific passing offenses — head coach Pete Carroll doggedly maintained that sticking with running the ball gave the Seahawks the best chance to win. Though they attempted the fewest passes in the NFL, the Seahawks went 10-6 and earned a playoff berth. But that reliance on the run may have been Seattle’s undoing in its 24-22 loss to the Dallas Cowboys in the NFC wild-card game. In the first half the Seahawks’ running backs rushed nine times for an anemic 2.1 yards per carry. Most of those runs came in a particular sequence: rush-rush-pass. All but three of Seattle’s first-half rushing attempts originated from the rush-rush-pass play sequence. And despite the lack of success using that pattern of plays against the Dallas defensive front, Seattle opened its first possession of the second half by calling it again. The result was a punt. The notion of establishing the run is deeply ingrained in NFL culture. Coaches and play-callers laud the approach for its ability to keep a team “on schedule” and “ahead of the chains,” both of which are football shorthand for picking up enough yards on first and second down that you stand a good chance to extend a drive. True believers think that if you abandon the run too early, you make your team one-dimensional and forfeit an important edge in toughness. You’re no longer imposing your will on a defense, and this will manifest itself in worse results overall. But is this true? Does running help a team convert more first downs and extend drives? And does the order in which you call pass and run plays matter? 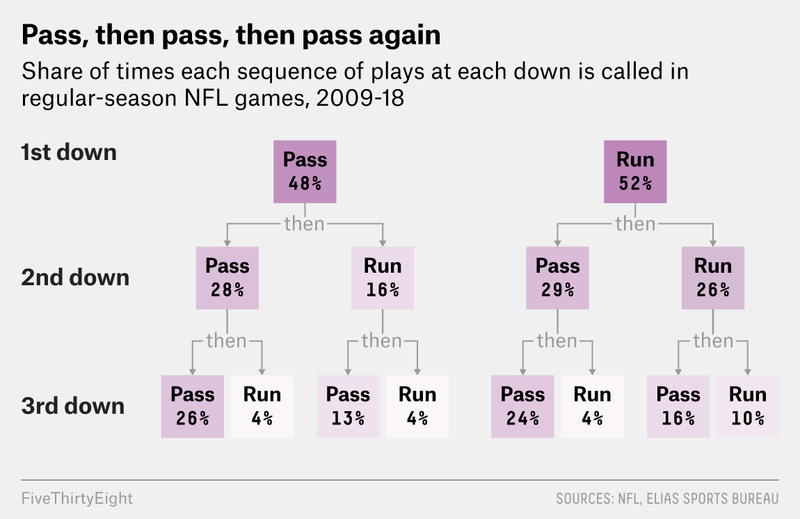 To answer these questions, I looked at every play called in the NFL regular season from 2009 to 20181 and compared the result of each of the possible permutations of run and pass play sequencing2 using expected points added and success rate.3 I calculated EPA and success rate for every first-down play; then I looked at every sequence that did not absorb into a first down and extended to second down and then third down, calculating the EPA and success rate for each call. Only sequences of three plays are included in the final analysis. Leaguewide, rushing is the preferred play call on first down, after which passing takes over as the dominant play type, especially on third down. Over the course of the 2018 season, there was no three-play sequence that Seattle favored more than rush-rush-pass. The Seahawks called rush-rush-pass 26 percent of the time, a rate 10 percentage points higher than league average. Yet despite the high frequency with which Carroll and offensive coordinator Brian Schottenheimer used the pattern, they were not successful with it. Just 41.2 percent of their rush-rush-pass sequences ended in success. Meanwhile, on three-play sequences where the Seahawks started with a pass and mixed in a run afterward, they were successful 88.9 percent of the time (pass-rush-rush), 71.4 percent of the time (pass-pass-rush) and 50 percent (pass-rush-pass) of the time. Frequencies do not add up to 100 percent because of rounding. These results hold generally across the league as well. Pass-rush-rush is the most successful three-play sequence, followed by pass-pass-rush and rush-pass-rush. On first down, passing will net you at least 5 yards (enough to make the play a success) 47 percent of the time, while running the ball will get you the same result just 32.8 percent of the time, 14.2 percentage points less often. On second down, the gap closes to about a 7 percentage-point advantage for passing. Play-calling patterns that end in a pass on third down have a negative expected value across the board. If we look at each sequence in terms of EPA per play, we see that the only positive EPA values on third down are on running plays. 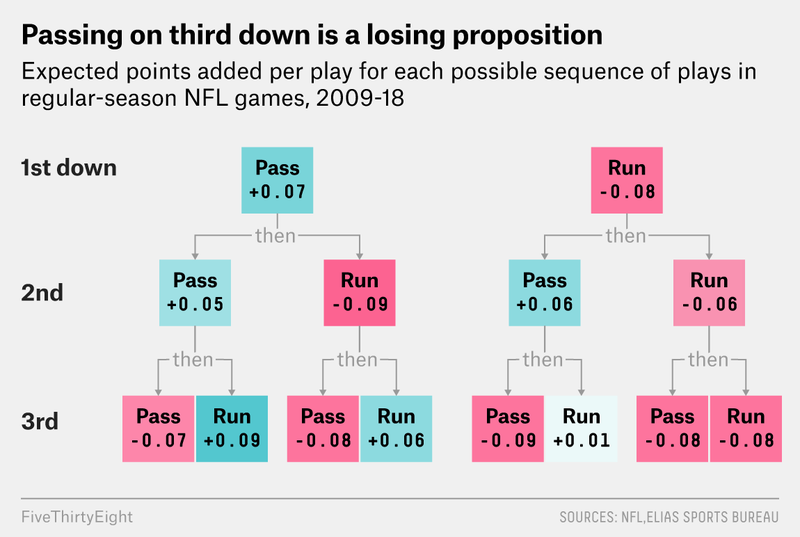 This makes sense: If you are passing on third down, it strongly implies that the first two plays in the sequence did not end well, and you likely have a third-and-long situation. Meanwhile, the opposite outcome is true on first and second down. There are no positive EPA rushing nodes, and all passing plays return positive expected value. This result is the exact opposite of what we would expect to find if establishing the run via play sequences like rush-rush-pass were winning strategies. Instead of making a team less predictable, establishing the run on first and second down creates a game state that is often quite predictable for the defense. The opposing team is expecting a pass on third down because the first two plays were unsuccessful. Surprisingly, two of the top three teams in net yards per passing attempt in 2018, the Rams and the Chiefs, actually do have success with the rush-rush-pass play sequence. Kansas City, the most dominant passing team in the league, was successful 53.3 percent of the time with rush-rush-pass. 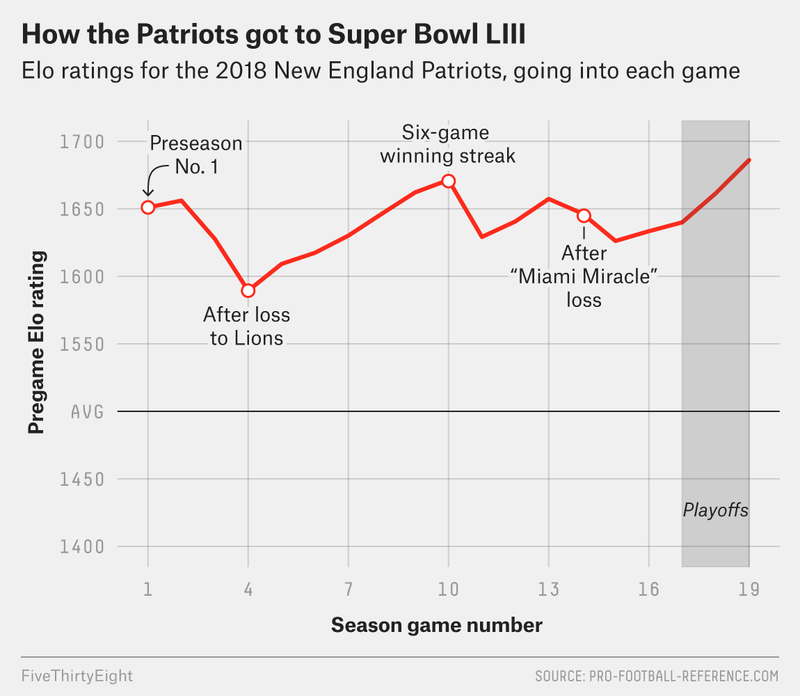 But the Chiefs ran the sequence just 15 times all season for a total share of 9 percent of all plays — 7 percentage points below league average — and they were mostly unsuccessful with the first two plays in the chain. When the Chiefs called back-to-back runs on first and second down, the second run was successful just 47.7 percent of the time. 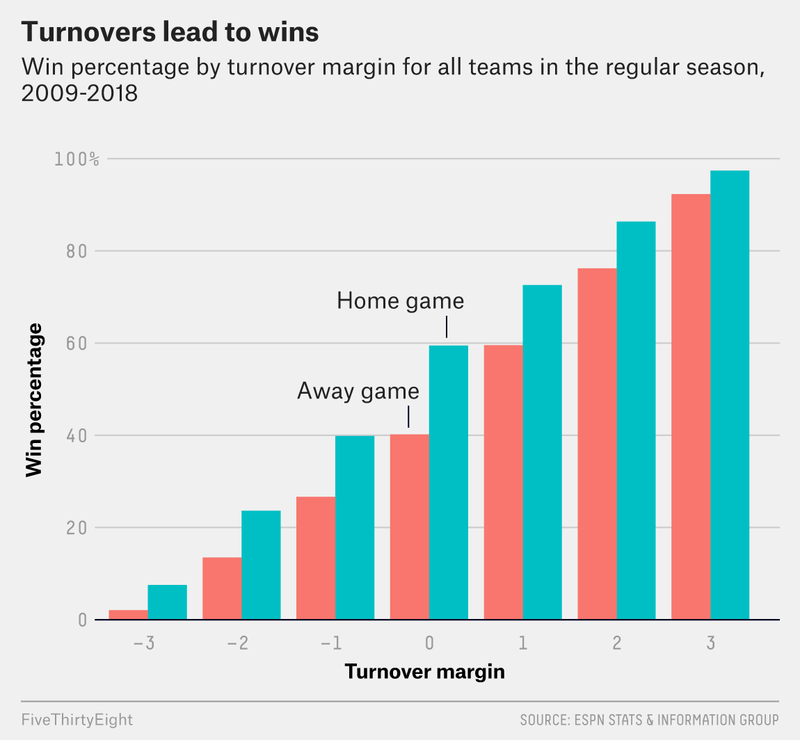 This suggests that the success of their third-down passes owes itself more to the strength of the Chiefs passing game and quarterback Patrick Mahomes than to the running plays that led up to them. The story is similar in Los Angeles. 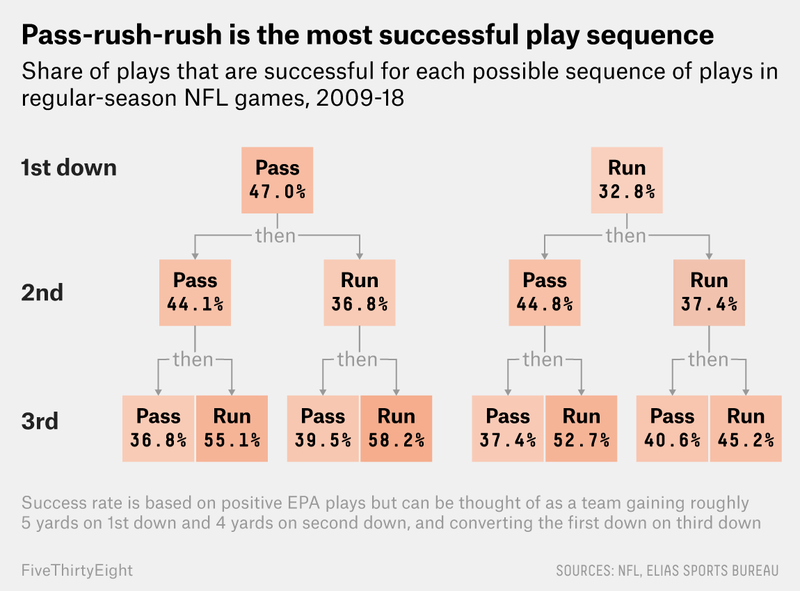 Sixty percent of rush-rush-pass play sequences ended in success, and the Rams used the pattern at exactly the league-average frequency. 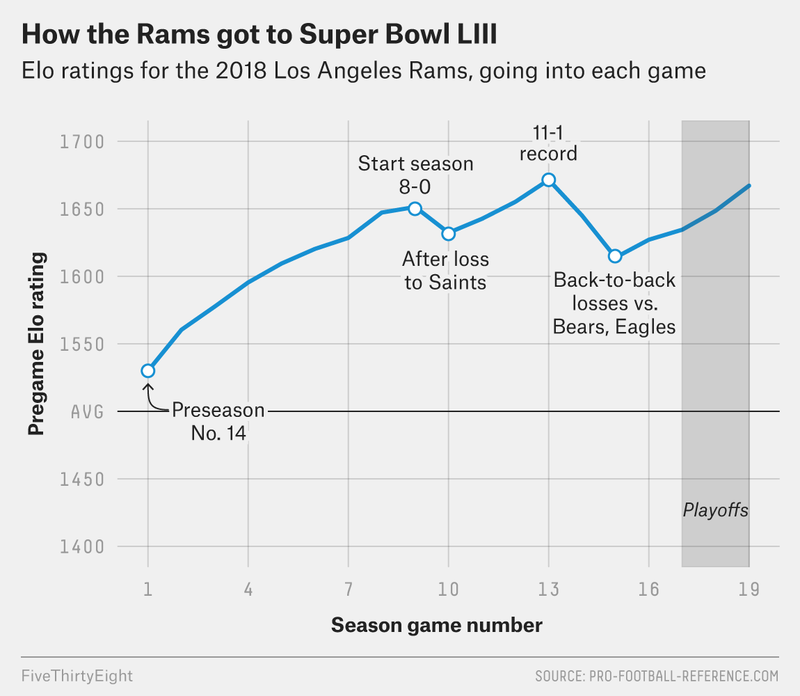 Again, however, when the Rams called back-to-back runs to begin a sequence, the second run was successful just 46.1 percent of the time, leaving them 5.8 yards left to gain for a first-down conversion on average. The success the Rams enjoyed on third-down passing attempts appears to be independent of the rushing plays that preceded them. 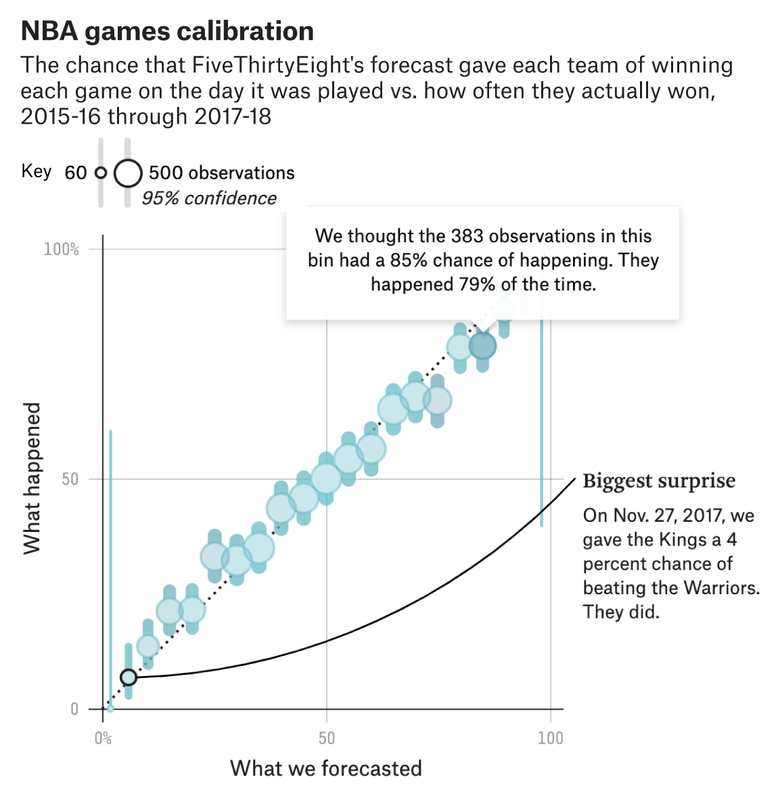 While the precise order in which passes and runs are called may not matter so much — several combinations are roughly equivalent to one another according to success rate — some trends are clear. Passes are more effective when called on early downs, and runs are more effective on third down. Running on first down, while often a mistake, can be salvaged with a pass on second down. And if you’re going to rush on back-to-back plays to open a series, you should do so sparingly because it will leave your team in an obvious passing situation more often than not. Your passing attack — and QB especially — will need to be well above average to consistently convert in those high-leverage spots where all deception is gone and defenders can be confident that they know what’s coming. For decades, the draw play has been one of the NFL’s most reliable tricks to fool overeager defensive lineman. The play mimics a pass — in the action of both the quarterback and the offensive line — until the last second, when the ball is handed off to the running back. When it works, the runner can often slice through holes untouched because defenders are busy trying to evade offensive linemen for a sack of the quarterback. The play may seem like the perfect countermeasure to keep a defense honest in the modern NFL. Yet for some reason, the draw play has been all but erased from teams’ playbooks. Offenses today are more pass-happy than ever before. And defenses have had to respond with more aggressive stunts and blitzes by rushers quicker and more desperate to pressure passers. So what better way to cross them up than by using a draw play? 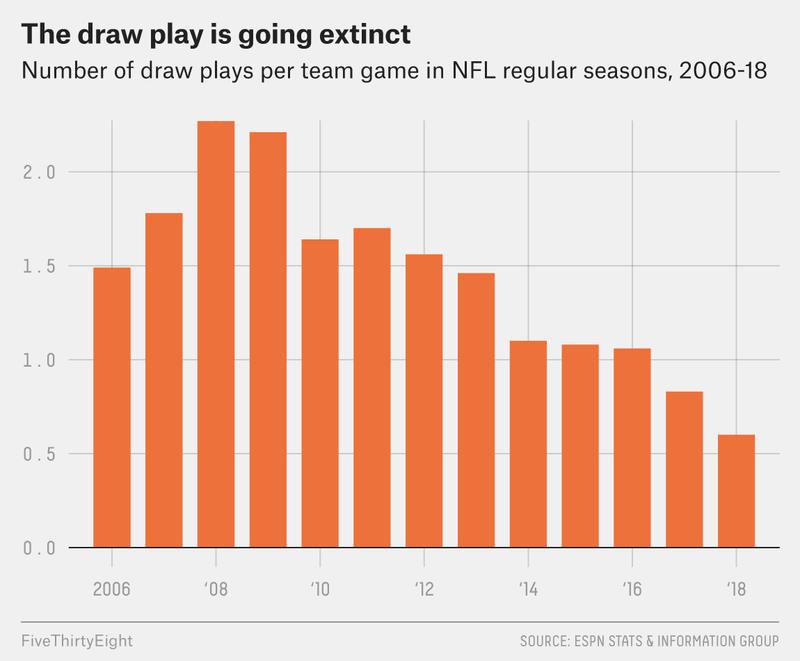 But during the 2018 season, teams ran the play just a little more than once every two games, down from well over two per game just 10 years ago. This is despite the success rate of the play used on first or second down being better than that of all rushes by running backs on those downs.1 According to the ESPN Stats & Information Group, the success rate2 on first- and second-down draws this year is 41.8 percent, compared with 38 percent on all RB runs on those downs. And draws on any down result in longer gains on average (5.29 yards per attempt) than other running back runs (4.35). The Los Angeles Rams called only one draw play all season. (It didn’t work.) The New Orleans Saints waited all the way until Week 10 to run their first draw play of the season — a successful one. That two of the league’s most innovative offensive coaches — Sean McVay and Sean Payton — basically ignore the play seems like a bad harbinger for its survival. But the maestro of the NFL’s best offense, Kansas City’s Andy Reid, is one of the league’s greatest proponents of the play. That makes perfect sense: He’s essentially a Brown disciple, given that his West Coast offense was originally conceived by Bill Walsh when Walsh coached on Brown’s staff with the Bengals. The Chiefs, who will play Indianapolis in the divisional round this weekend, have run a draw 16 times this year and have had success 10 times. That success rate of 62.5 is by far the best of the 10 teams that have run more than 10 draw plays. The Chargers also have used the draw well, generating 64 rushing yards in 10 attempts, six of which graded as successful. The draw is often thought of as a play of last resort: When teams are faced with virtually hopeless distance to convert a third down, they can use the draw to stop the bleeding before punting. But only 37 third-down draws this past season were in situations when the offense needed at least 7 yards to convert. The vast majority were used on first and second down (256 out of 307 draw plays) and out of the shotgun (253 total draw plays). Of course, the latter makes sense given that the main purpose of the play is to mimic a pass. Reid primarily uses the draw when teams have virtually no defenders dedicated to the run, meaning no more than six defenders “in the box” at or near the line of scrimmage. That was the defense deployed 13 of the 16 times Reid called a draw this season, and the call was successful eight of those times. If defenses continue with this look, a draw could be the perfect call. With the Chiefs offense setting records and NFL coaches looking at it for design and play-calling inspiration, there’s a good chance that teams will soon discover that one of the oldest forms of NFL deception may have even more relevance in the modern game.